Every summer Madeleine is sent to stay with her bullying uncle Monsieur Lard, one of the worst chefs in Paris, and set to washing up endless dishes in the kitchens of his restaurant, the Squealing Pig. 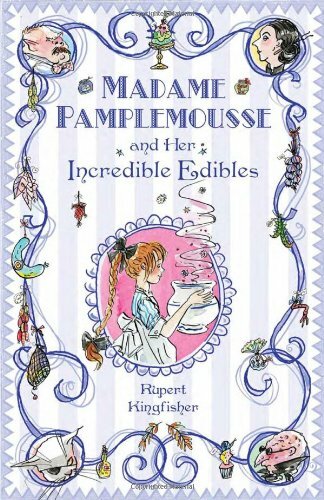 It is on an errand to buy pâté that she comes upon a tiny backstreet shop, Edibles, run by the mysterious Madame Pamplemousse. Madame P’s pâté turns out to be so good that Monsieur Lard will do anything to steal the recipe – including forcing Madeleine to spy on the proprietor while working in her shop. Madame P and her large white cat, Camembert, are of course more than a match for Monsieur Lard and along the way the two help the much put upon Madeleine to discover not only her own genuine talent for cooking but herself. Rupert Kingfisher must be an excellent cook as he writes about food, its taste and smells with such gusto, pleasure and wit – Madame P’s shop, for example, has jars of Woodland Snails Stuffed with Sausage Meat, Giant-Squid Eyes in Balsamic Vinegar, Barracuda Fillets in Garlic Butter and Velociraptor Heart in Red Wine amongst many other items. Such serious attention to food is of course very French and Paris by the Seine is well evoked in the narrative, in Sue Hellard’s scratchy line drawings and in the decorative design of this small format book with its art nouveau typeface to open each chapter. This delightful modern fairy tale could be just the Christmas present to encourage a young reader to savour life.